A cost effective solution that performs well is simple. The Satron VCF transmitter remote display unit can be installed up to 45 ft. away from the sensing unit. The Display unit has electrical connections for 3 binary inputs, 3 relay outputs and two 4-20ma outputs. All connections can be active. Intuitive, menu driven interface makes for simple set-up, calibration and troubleshooting functions. VO Advisor(SW) allows for computer interface. Zero and Span adjustments: Calibrated span can be selected from the RDU for required measuring range. These inputs may be managed by using Satron VO Advisor and a computer. Reliable and maintenance free: No moving parts and no sample lines guarantee high reliability and no maintenance. Refiner Control: Satron VCF measures the effect of the refining process by providing a real time Freeness output. 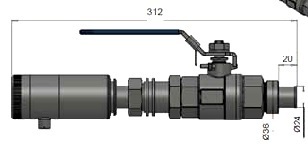 Sensor can be installed right next to the pump or right after the refiner. Actual Results: Trend below shows Refiner load versus Freeness output of the transmitter. Satron VCK is an optical instrument that uses the latest LED based strobe light technique to measure the Kappa by utilizing multiple wavelengths. In addition, a secondary measurement of consistency is also available as a standard. Both measurements are continuous with 4-20 mA outputs. Costly auxiliaries, such as remote pulp samples, water valves and transport lines are not needed, because the measuring probe is a true in-line sensor, mounted directly in the process, typically right next to an outlet pump. Due to the mechanical design, the probe can be removed or inserted without shutting down the process. While having no moving parts, the probe doesn’t require any regular Maintenance. Furthermore, the instrument is totally immune to (remove-such as) flow rate, turbulence, pressure, temperature, air, conductivity or color. VCS- A simple, reliable and cost-effective measurement solution. Satron VCS uses a proprietary measuring technique to determine the shive content of the pulp. By calculating a matrix of strobed LED responses from the furnish the VCS produces a real time Shive number for use by operations. 0 to 7 % + consistency may be measured with the second measurement channel included in the VCS. 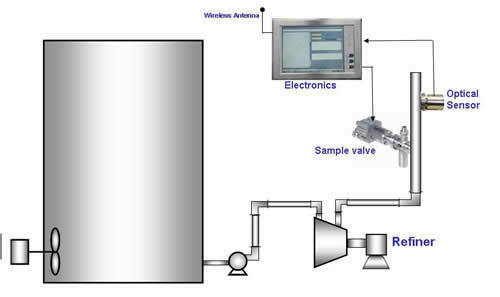 Typical applications include shive measurements to and from the screens, from the Blow Tank and in the feed to the paper machine. The Satron VCS does not require maintenance. Unlike other shive measurement technologies that measure off-line, the VCS is inserted directly into the process stream close to the pump.